From the author of The Myth of Sanity (2001), a remarkable philosophical examination of the phenomenon of sociopathy and its everyday manifestations. Readers eager for a tabloid-ready survey of serial killers, however, will be disappointed. Instead, Stout (Psychiatry/Harvard Medical School) busies herself with exploring the workaday lives and motivations of those garden-variety sociopaths who are content with inflicting petty tyrannies and small miseries. As a practicing therapist, she writes, she has spent the past 25 years aiding the survivors of psychological trauma, most of them “controlled and psychologically shattered by individual human perpetrators, often sociopaths.” Antisocial personality disorder, it turns out, occurs in around four percent of the population, so it’s not too surprising that treating their victims has kept Stout quite busy for the past quarter-century. Employing vivid composite character sketches, the author introduces us to such unsavory characters as a psychiatric administrator who specializes in ingratiating herself with her office staff while making her patients feel crazier; a captain of industry who killed frogs as a child and is now convinced he can outsmart the SEC; and a lazy ladies’ man who marries purely to gain access to his new wife’s house and pool. These portraits make a striking impact, and readers with unpleasant neighbors or colleagues may find themselves paying close attention to Stout’s sociopathic-behavior checklist and suggested coping strategies. 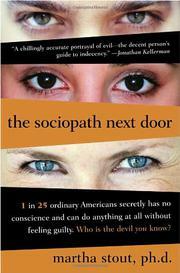 In addition to introducing these everyday psychopaths, the author examines why the rest of us let them get away with murder. She extensively considers the presence or absence of conscience, as well as our discomfort with questioning those seen as being in power. Stout also ponders our willingness to quash our inner voice when voting for leaders who espouse violence and war as a solution to global problems—pointed stuff in a post-9/11 political climate. Deeply thought-provoking and unexpectedly lyrical.